Yes, the rough Tiger Eye has arrived and there is a good amount of it. I am pleased to say it’s all good quality and in good size chunks as well, all of which would fit on an 8″ saw blade. 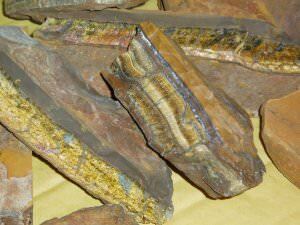 For the Lapidary these chunks of Tiger Eye rough offer the chance of many cabochons per chunk and they are also a good size for the mineral collectors display case. As always I will list these in the rough rock shop as individual items allowing you to buy as much or as little as you need. I aim to get this Tiger Eye live on the shop this weekend.